I trusted my dogs a hundred percent, but couldn’t believe any lion could run this far, that fast, and not give out, so I went to check the tracks. I wondered if some of the younger hounds had gotten off on a coyote or something else besides a lion (p. 7). When he finally caught up with his hounds, Glenn realized they had not been following a lion at all. They were chasing a jaguar (Panthera onca) (Glenn, 1996). Not even six months after this event, rancher Jack Childs encountered a second jaguar in the Arizona borderlands (Rabinowitz, 2014; Mahler, 2009). 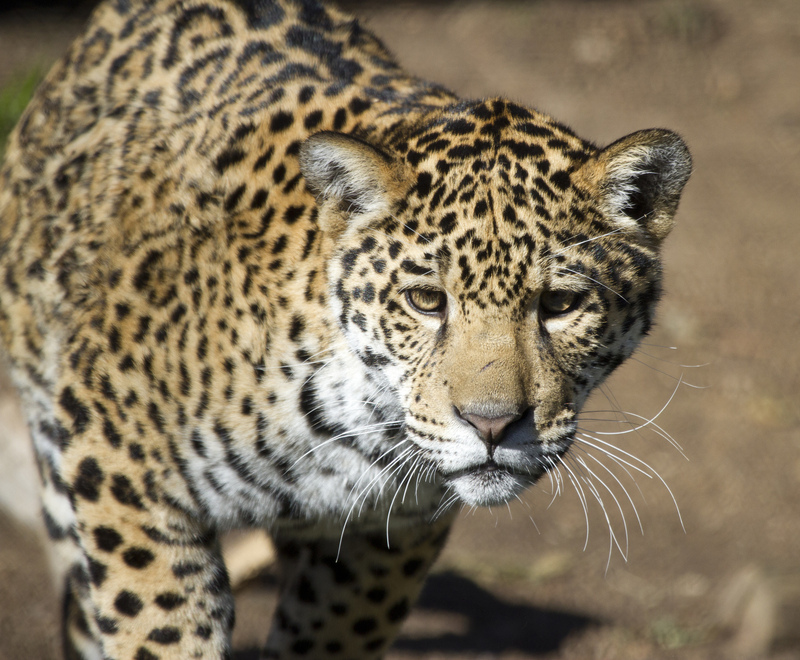 Approximately ten years after the last known jaguar in the United States was killed, el tigre had returned. The jaguar Childs spotted was later named Macho B. 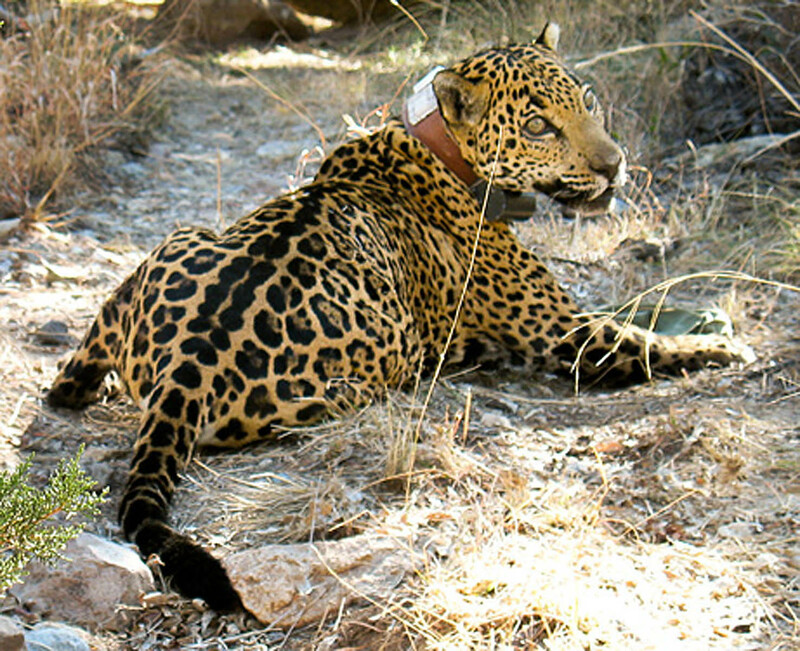 In February 2009, the Arizona Game and Fish Department illegally captured him and fitted him with a radio collar. The event cost Macho B his life. 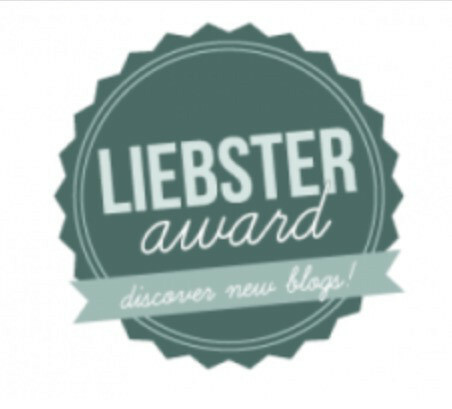 Image courtesy Richard Mahler. These two sightings set off a hailstorm of activity. First, U.S. jaguars had to be protected. They were not included in the 1973 Endangered Species Act (ESA), and the United States Fish and Wildlife Service (USFWS) was aware of this by 1979. But in 1997 the cats were still not on the list. Glenn’s and Child’s sightings, along with litigation from environmental groups, helped to rectify this (Rabinowitz, 2014). El Inmenso is one of the jaguars roaming Sonora’s scrub-lands. Photo (c) Northern Jaguar Project and reproduced from www.northernjaguarproject.org. The next step was to figure out where these jaguars had come from. After analyzing the evidence, it was determined that they were most likely dispersing males from the Mexican state of Sonora. This is the home of the northernmost known breeding population of Panthera onca, and it is no more than 200 miles from Child’s and Glenn’s encounters (Rabinowitz, 2014). Since 1996, the presence of at least five male jaguars has been confirmed in the United States (Alanen, 2015). The only current resident, who is in the process of being named, has been here since at least 2012 (Ikenson, 2015). 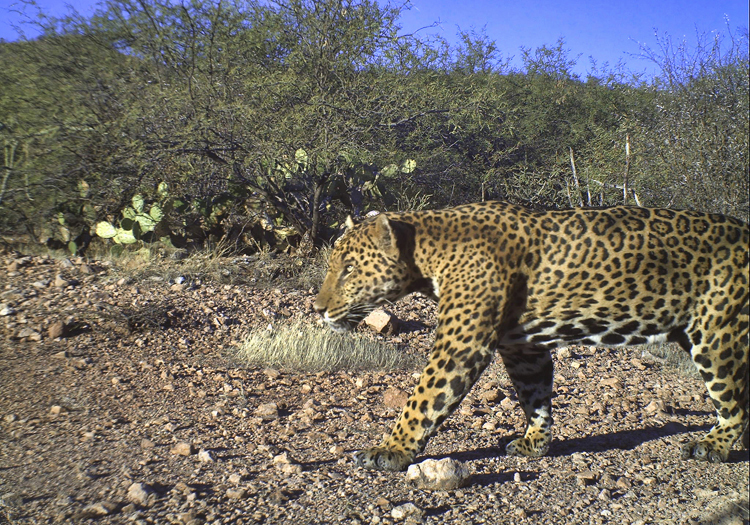 This jaguar received further protection in 2014, when pressure from the Center for Biological Diversity led to the designation of 1,194 square miles of critical habitat in Arizona and New Mexico (Center for Biological Diversity, 2014). Despite this hopeful trend, the future for U.S. jaguars is far from certain. For one thing, there has been no evidence of any female jaguars north of the U.S.-Mexico border. This might make reproduction difficult. Ironically, the recent establishment of critical habitat may also complicate jaguars’ recovery (Rabinowitz, 2014). Svancara et al. (2015) found that local ranchers were uneasy with this move. They were not antagonistic towards jaguars, but they were concerned about how ESA regulations might affect their lives. They also suspected that those who pushed for the critical habitat designation may have had hidden agendas (Svancara et al., 2015). But the most significant impediment to the jaguar’s recovery in the U.S. is the current approach to border security. As of now, border walls span 670 miles of the U.S.-Mexico border (Loiaconi, 2015). These barriers are seriously disrupting southwest ecosystems (Fischer, 2015; Northern Jaguar Project), but they are not stopping people from crossing into the United States (Loiaconi, 2015; Macdonald, 2015). There is now talk, mostly by Donald Trump, of walling off the entire 2,000 mile-long border (Loiaconi, 2015; Macdonald, 2015). This would make it incredibly difficult for jaguars to recolonize the U.S. Humans may be able to find ways to circumvent existing border walls, but many animals cannot. 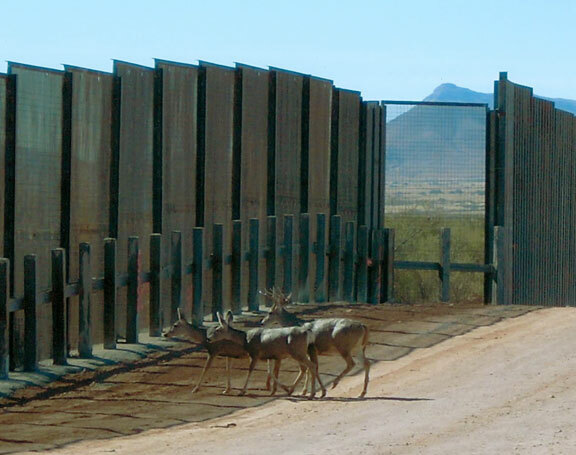 To wall off the entire U.S.-Mexico border would have serious implications for wildlife. Image (c) Northern Jaguar Project and reproduced from www.northernjaguarproject.org. By reappearing in 1996, U.S. jaguars initiated their own recovery plan. But if they are to succeed, they will need our help. First of all, the breeding population in Sonora must be protected. Effective conservation in northwest Mexico may increase the likelihood that more jaguars will enter the United States. Luckily, such efforts are underway. 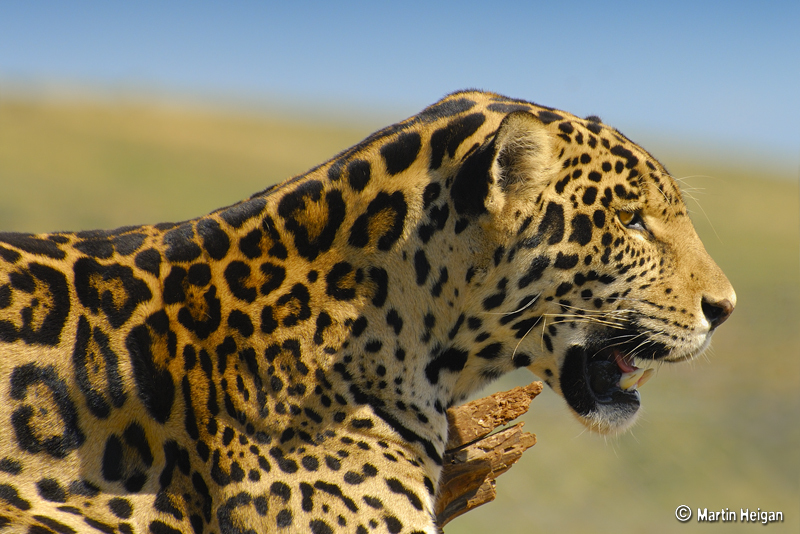 Second, the concerns of ranchers living near jaguar critical habitats should be addressed. Many of the individuals interviewed by Svancara et al. (2015) had positive attitudes towards jaguars and wildlife conservation in general. So if their fears are allayed, they may prove to be powerful allies (Svancara et al., 2015). Lastly, the issue of border security must be dealt with. Species recovery does not happen in a vacuum, and the proposed border wall would have significant environmental consequences. Therefore those who are concerned about jaguars and other southwest wildlife should make their opinions known. Jaguars’ presence in the southwest borderlands suggests they are more adaptable than sometimes thought. As such, the challenges facing their recovery can be overcome. If we protect the population in Sonora, collaborate with local stakeholders, and make smart decisions about border security; el tigre will once again roam the American southwest. Lamberton-Moreno, J. (2015). Student project results in new jaguar sighting. Retrieved from http://www.skyislandalliance.org/2015/09/new-jaguar-sighting/. Northern Jaguar Project – a binational effort to save the northernmost jaguar population. http://www.northernjaguarproject.org/. Southwest Jaguars: A Voice for the Jaguars of the Southwest United States. 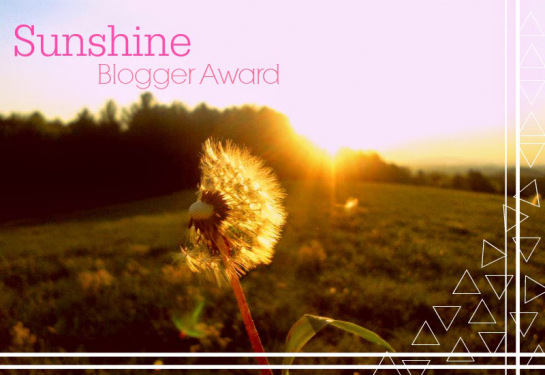 https://swjags.wordpress.com/. These two posts together are terrific to read Josh. Its a difficult issue for the US, but as you point out, wildlife know nothing about boundaries. National lines on maps are only relevant to humans! Thanks Margi! Yes, the current immigration situation is becoming very contentious. But walling off the entire US-Mexico border would only make things worse. It would sever crucial wildlife corridors, earn international scorn, and fail to solve the problem. I hope we don’t miss out on this opportunity to restore the most iconic creature in the Americas to our side of the imaginary line.